Saffron plant, Crocus sativus, is the source of a rare spice valued as a food flavouring and colouring. This spice is produced from the long orange-red stigma and style of the flower. A very distinctive aroma. The tea of Saffron is used as a remedy for chronic haemorrhage of the uterus. 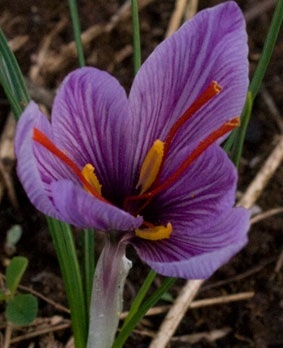 Saffron plant is a native of the Middle East and prefers good sandy loam in a protected, sunny position. Flowers are reddish purple, funnel shaped, appearing in summer. Drought and frost resistant. A perennial plant, it growing to 0.3m x 0.5m. Be the first to review “Saffron, plant” Click here to cancel reply.